Austrian skydiver Felix Baumgartner jump from Space to Earth to make a new world recod on free falls category on last Sunday at 6:30 A.M.(local time). 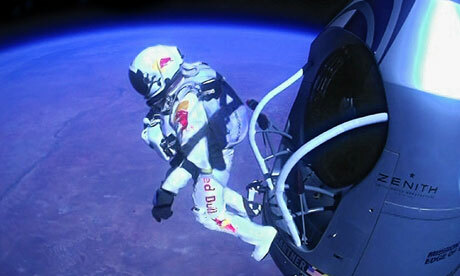 This time he jump from 128000 feet (39 Kilometer) heights. On Sunday morning, Felix ride on balloon from New Mexico Roswell, USA, and dive from there at 6:30 A.M. After 10 minutes free falls with high speed, he opened his parasuit and landed on earth safely.